Dalit literature has arrived in Tamil, and it has come of age. 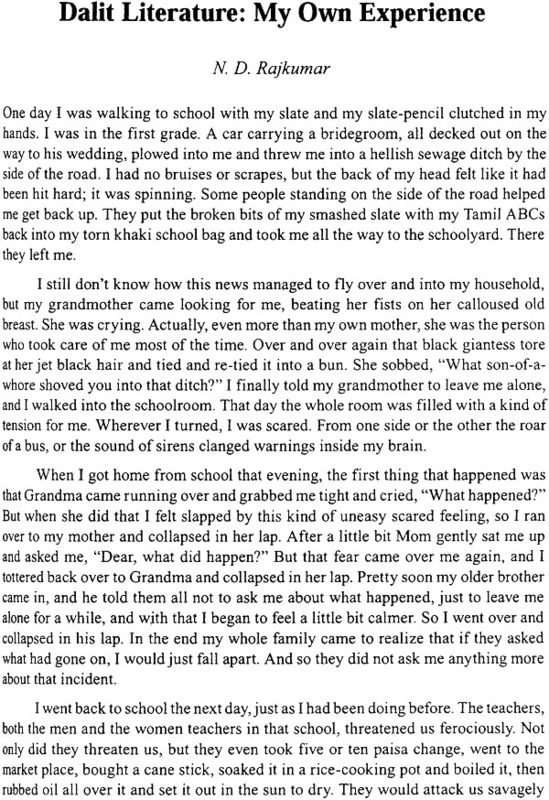 Until the past twenty or thirty years, Dalit people in India, traditionally the recipients of some of India’s worst discrimination and oppression, did not have much of a literary voice Now, however, there are voices representing millions of Dalits-people who certainly do speak for themselves, but many of whom cannot write for themselves, and would not be published if they did. Further, as Bama says, “...everyone now acknowledges that for the past few years Dalit writings have had an enormous impact on society.” Clearly, the issues raised by Dalit voices do matter, on both a national and an international stage. Some of those voices, translated from Tamil into English, are contained in this volume, along with an extensive introduction. Each of the nine Dalit authors collected here has contributed an essay on his or her own experience as a Dalit writer; seven of them also contributed previously unpublished short stories or poems. Their works often display an in-your- face character, but there are also subtle nuances and carefully drawn characters and situations. 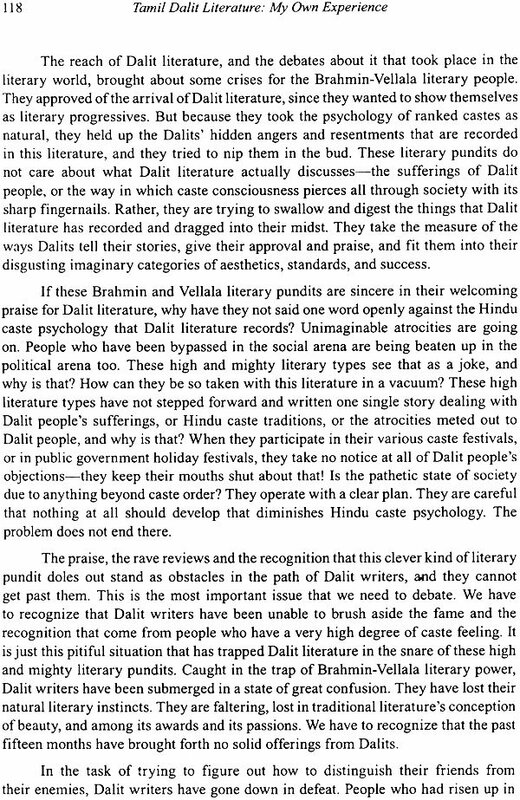 Dalit literature is fresh and new, and old and stale, all at the same time. It arises directly out o lived experiences in an unjust world. David C. Buck is a translator of classical and modern Tamil literary works into English. He teaches mathematics at Elizabethtown Community and Technical College in Kentucky, U.S.A.
Kannan M. Is a Rsearcher in Contemporary Tamil in the Department of Indology, French Institute of Pondicherry. 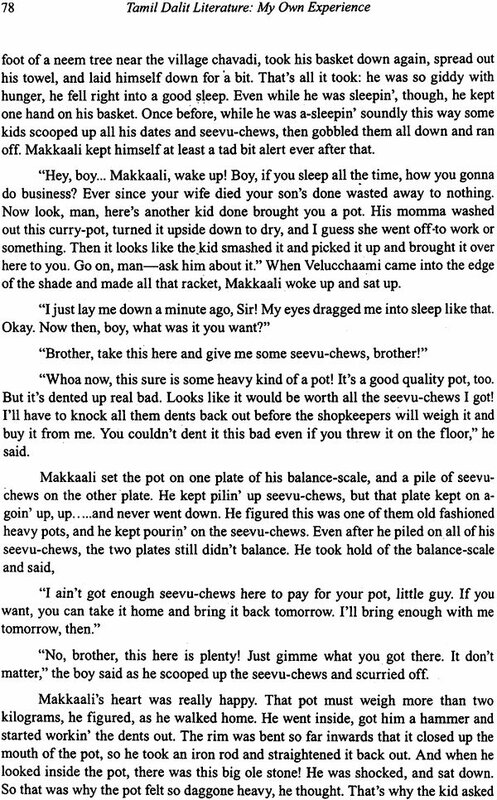 One thing should be abundantly clear: there really is such a thing as Dalit writing in Tamil. This did not used to be true. 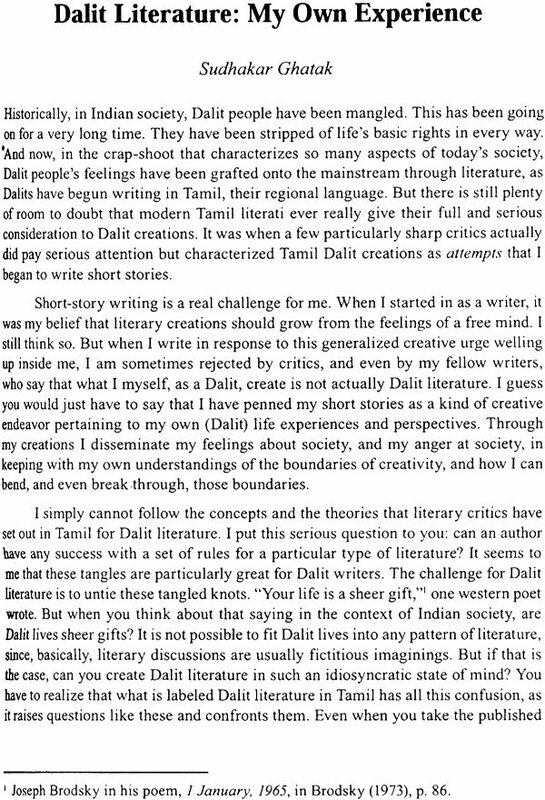 Until the past twenty or thirty years, Dalit people did not have much of a literary voice. Now, though, there are voices representing millions of Dalits-people who certainly do speak for themselves, but many of whom cannot write for themselves, and would not be published if they did. Some of those voices, translated into English, are contained in this book. 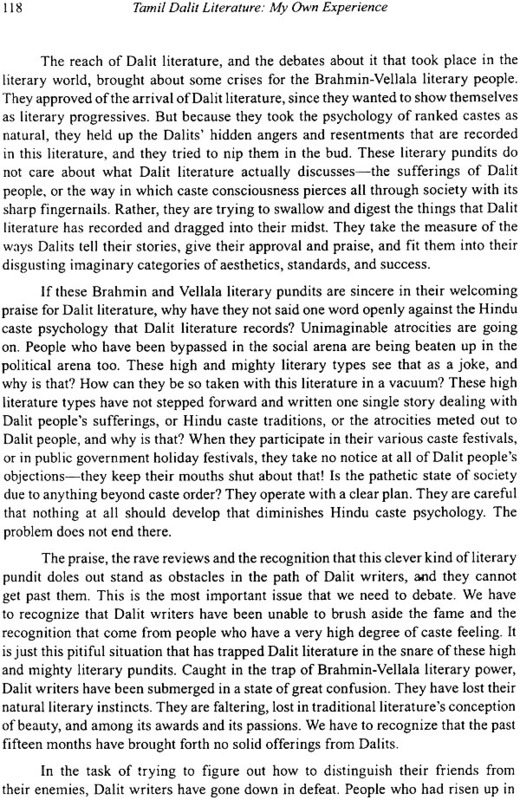 A lot of people have expended a great deal of energy in trying to decide whether this Dalit writing should be (or shouldn’t be) called Dalit literature, based upon accepted literary standards of one type or another. 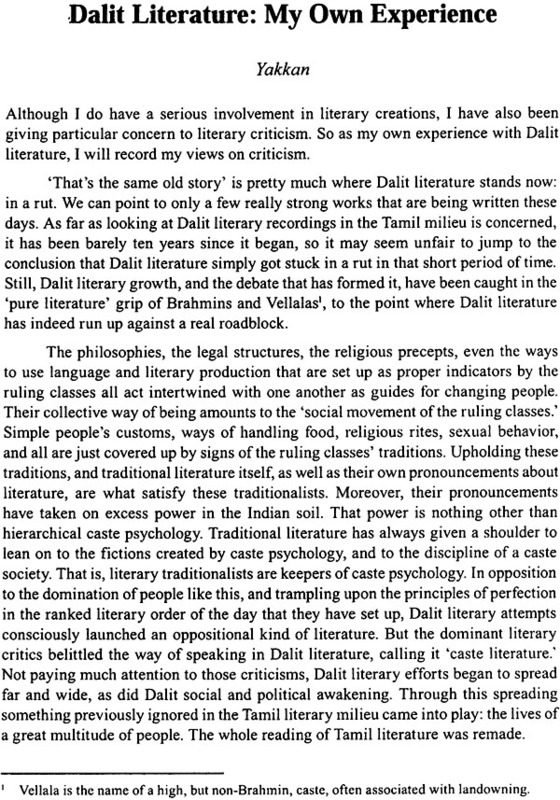 Our answer is that while some of it is literature, of many varied types, of new and old literary forms, and of varied quality, some of it is really more like methodical, almost ethnographic, recordings of Dalit life in Tamil. Much of it, though, as Sudhakar Ghatak puts it in his essay contained in this book, “...erupts as a scream piercing the wind.” In any case, we agree with Bama when she says, also in. This book, “...everyone now acknowledges that for the past few years Dalit writings have had an enormous impact on society.” Clearly, the issues by Dalit voices do matter, on both a national and an international stage. As you read the essays, short stories, and poems that follow, you will easily recognize the in-your- face character of much of it, but you will also see subtle nuances and carefully drawn characters and situations. Dalit literature has arrived. It is fresh and new, and stale, all at the same time. It arise directly out of lived experiences in an unjust world. 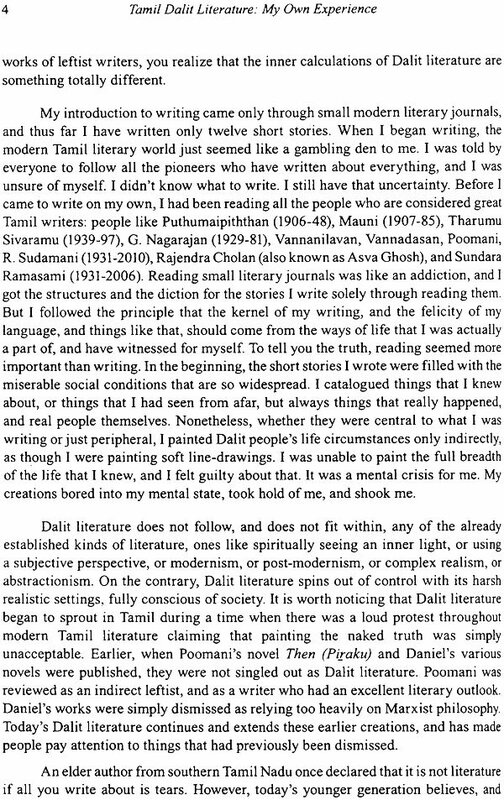 On January 30, 2004, some sevents people gathered at the French Institute of Pondicherry in southern India to participate in a lively one-day seminar on Tamil Dalit Literature: The Challenge and the Response. Out of that seminar came the collected volume Dalit Ilakkiyam: Enatu Anupavam, which is translated here. These writings are all decitledly personal, and so are our own approaches to the work. 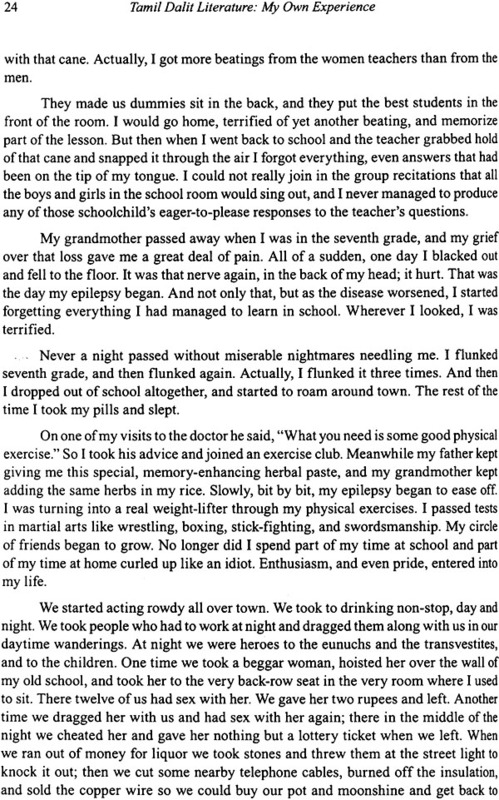 That is, both the book and this Introduction also arise directly out of lived experiences. The volume includes nine essays by Tamil Dalit writers on the theme Datil literature: my own experience. It also includes original creative works-short stories or poems-by seven of them. Since two of them are publishers and essayists, their essays in themselves constitute their original contributions. Most people in India are hereditary members of one caste or other, and these caste groups are arranged hierarchically, so that people near the top of the ladder are defined as “cleaner,” “purer,” “more respectable,” and generally “better” than others. Dalit people are at the very lowest end of the caste hierarchy in India. 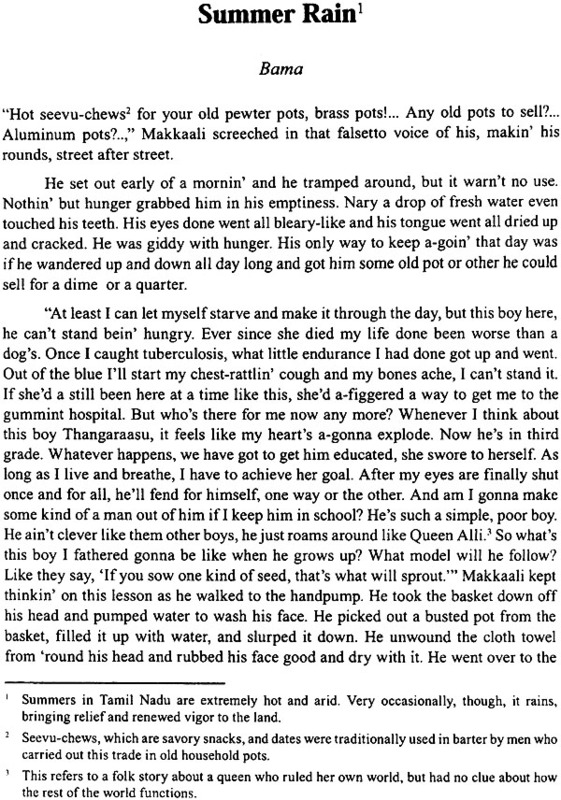 They have suffered the humiliations associated with being called “dirty,” “impure,” less respectable,” and “generally inferior,” for centuries, and this includes the curse of so-called “untouchability.” For example, one of the authors presented in this translated volume comes from a caste whose members, in years past, were expected to stay indoors during daylight hours so their shadows would not pollute the earth on which we all walk. And Dalit people in some situations were required to attach brooms to their rumps to obliterate their footprints in the street dust as they walked through upper-caste areas. Thankfully, these practices no longer hold sway in Tamil Nadu. Such attitudes and expectations have historically been used to excuse and justify the exploitation which upper-caste people imposed on those of lower castes.